Android Celebration 25 Billion Giveaway 25 Cents for Android fans! Good news for Android fans! You enjoy the great discount 75+% to buy the popular apps in Google Play! 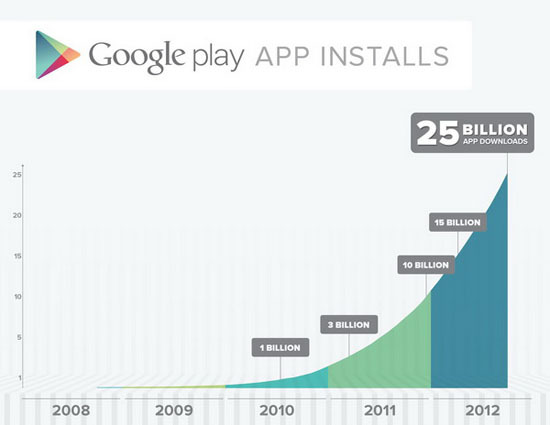 Since Google introduced Android as Google Play, they surpassing 25 billion downloads from 2008 to 2012! Every day, you’ll be able to choose from a collection of apps from some of the world’s top developers including Gameloft, Electronic Arts, Rovio, runtastic, Full Fat and more. And all for just 25 cents. That’s a lot of choice to make you love Android! So, Google like to celebrate it with their giveaway of special discounts for the next five days. Ok, there are 13 top application in Google Play. You MUST to get the apps which you need to use in your daily; Angry Birds Space Premium, Office Suite Pro 6, Ocean HD, Tasks, Asphalt 7:Heat and Draw Something. Don't miss it! All are cheap, 0.25 cent only! For Malaysia, the special promotion - price: RM 0.80 sen only!